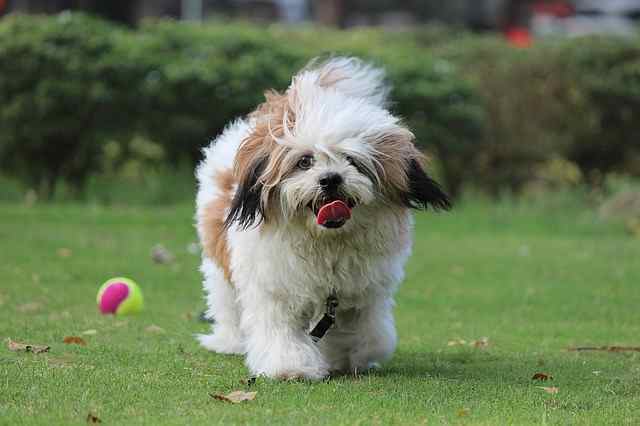 The Lhasa Apso is a small and sassy non-sporting breed with a big diva personality in a small dog. Lhasas are adorable, sweet and popular, and they can be considered the “Supermodel dog” because of their amazing coat of hair that is parted perfectly down the middle of their back. Their hair usually covers their entire body, which is longer than it is tall. Lhasas have gorgeous and dark features that are highlighted by their light golden coat of hair, and are very lively and intelligent. They also have a unique tail that is long, curly, and winding. The tail curls over the back adding a “cute factor” to this overall adorable dog’s appearance. Some Lhasa tails have a kink in them, which most Lhasas do not possess. It is said that if your Lhasa has a kink in their tail then they are considered good luck. The Lhasa, along like most dogs, needs its exercise, but is not a breed that heavily depends on it. If you forget to take your Lhasa on a walk one day, it will not complain, and will probably be as content as ever; however, they still need a small amount of regular exercise. This makes the Lhasa the perfect dog for elderly people. They are perfect for city living and condo living; however, they are very adaptable and can live pretty much anywhere. One interesting quality of the Lhasa Apso is that they are extraordinarily healthy dogs and can live well into their twenties. 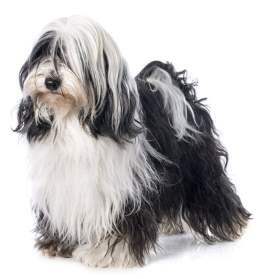 The oldest recorded Lhasa lived to be a whopping 29 years old. The Lhasa absolutely adore their families and owners and will stay very loyal to them with the appropriate attention and loving. The Lhasa Apso is an ancient breed originated in the Himalayans. For centuries, they were confined only to Tibet where holy men and nobles kept them in isolation where they performed as watchdogs. In Tibet, they called them “Apso Seng Kye” which directly translated to “bark lion sentinel dog.” In the 1930s, the Lhasa made it to the United States after being given to the US by the 13th Dalai Lama. Named after the sacred city Lhasa, the Lhasa Apso was considered sacred. Thanks to C. Suydam Cutting, the breed was spread to other parts of the world as well by introducing the Lhasa to the U.S as a gift from the Dalai Lama. The first of the breed was introduced in Britain in the 1920s, and America in the 1930s. Recent studies have shown the Lhasa Apso is one of the breeds that are most closely related to the ancestral wolf. In Tibet, Lhasas were never sold as adults and they only way someone could get one was as a puppy. Since these dogs were so sacred, they were very expensive and particularly hard to get possession of. Lhasas were used to warn the residents of Tibetan nobility and Buddhist monasteries if the intruder happened to sneak past the external guards. Lhasas were very good at their jobs and earned high credibility because of it. When this breed first came to America, they were referred to as Lhasa Terriers instead of the modern and more common name Lhasa Apso. The Lhasa has been identified as one of the 14 most ancient of all dog breeds. This suggests that humans first began breeding dogs because they wanted a companion that would also warm their laps. They were first accepted by the American Kennel Club in 1935 and now rank 65th in popularity among all of the AKC recognized breeds. This particular breed is very loyal to those close to them, but is very wary of strangers, which is why they make such effective watchdogs. 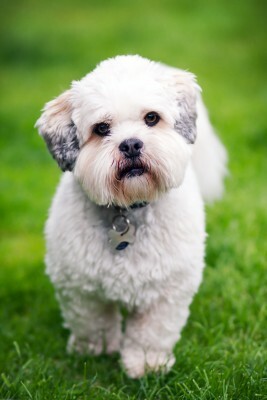 Lhasas can also be very hard headed and are prone to Small Dog Syndrome. That is a condition in which the dog seems to think that they are the alpha dog and that the human should listen to them. They tend to be snappy, anxious, and act out; however, these are NOT traditionally traits of the Lhasa Apso. 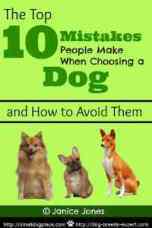 Small Dog Syndrome is human induced and is the cause of irresponsible owners. As hard as it will be to give in to the Lhasas cute and adorable face, there has to be an alpha in the relationship, and that is you. If you train and raise your pup right, they are adorable, friendly, sweet, and affectionate with a complete different character to those who are improperly raised. Lhasas are also very adaptable and can live pretty much anywhere; however, they are perfect for city living and condo living because they do not require an excessive amount of exercise. This also makes Lhasas good for families that are less active. This breed responds well to motivational training, and because of their tendency to be more on the stubborn side, it is a good idea to start training early. Overall, the Lhasa Apso is a very loving, friendly dog, and with proper care and training is not only a pet, but also a best friend. The Lhasa Apso is not the type of breed that one can just brush and comb every once in a while, and everything will be fine. They need regular visits to the groomers, especially if one is looking to show them. 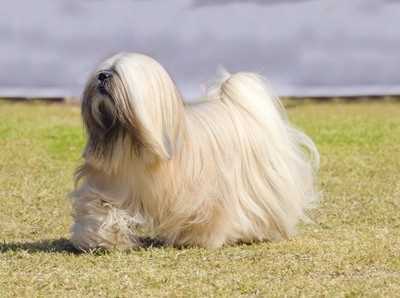 Typical Lhasas that are being shown have the long, silky hair that goes to the floor. This hair needs extra care, and even more regular visits to the groomer than your average pet might need. Grooming can be a lot of work, but usually most owners keep their Lhasa in a puppy cut. An advantage to this breed is that they do not shed much, making them ideal for those who struggle with allergies. While you might not see much of their hair on you or your furniture, the dead hairs need to go somewhere. Low shedding dogs tend to shed their hair into coat. 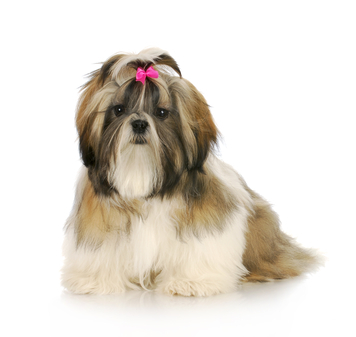 Lhasas have a thick double coat that continues to grow and can tend to mat if not brushed daily. First brushing with a pin or slicker brush, followed by a combing with a steel comb will assure that you have gotten down to the skin and removed all tangles and knots. Just a soft brushing over the top coat will leave mats in the soft undercoat which will continue to get larger if not removed. The pads of the feet also need to be checked as well as around the eyes and ears. Hair tends to grow excessively in their ears, which could lead to ear infections. If you plan to get your Lhasa's coat professionally groomed, the groomer will clip the hair between the foot pads and remove any hair in the ear canal. If you do the grooming for your pet yourself, then you will need to add those tasks to your grooming routine. There are different options for the hair on the head. Some people who want the long look will pull it up into a single top knot (as seen in the Shih Tzu breed) or enjoy pulling the hair into two pony tales. 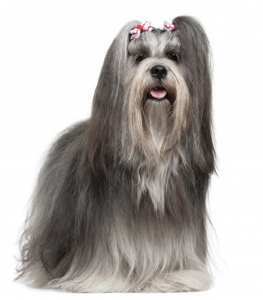 Typically, Lhasas are shown without the elaborate top knots seen in some breeds. In addition to the special grooming needs of the Lhasa, they also need to have their nails clipped about every couple of weeks and ideally their teeth should be brushed daily. Regularly grooming and brushing will leave your pups hair in perfect and beautiful condition. Lhasas are in general, very healthy dogs that can live to an upward of 20 years, although the average life span is 12 to 15 years.. They are prone to ear infections due to the hair growing excessively, but other than that they are in well condition. There are a few health concerns to keep your eye out for, but other than that you have a healthy dog on your hands. This is an orthopedic disorder where the ball of the hip does not fit snugly into the hip socket resulting in lameness and arthritis. In long haired breeds where the hair continues to grow, hair around the head and face can irritate the eyes. When the hair is pulled up and away from the eyes, this normally does not occur. But when shorter hairs begin to touch the eye they can irritate the cornea which is normally transparent. Over time, irritation from hair and even injuries, wind, smoke, dust or allergies can cause the cornea to become cloudy and ulcerated. Eventually the cornea appears darker. The color change will not cause pain, but some of the underlying problems can and will also eventually lead to blindness. This is common in brachycephalic dogs especially those that have prominent eyes that are easily exposed to injury. This is an extremely common ailment in small breed dogs where the knee cap slides in and out of place. Patella is the name for knee and luxation means dislocation. Dogs can become lame or live normally depending on the severity of the dislocation. An abnormal or under-developed kidney that often results in death. 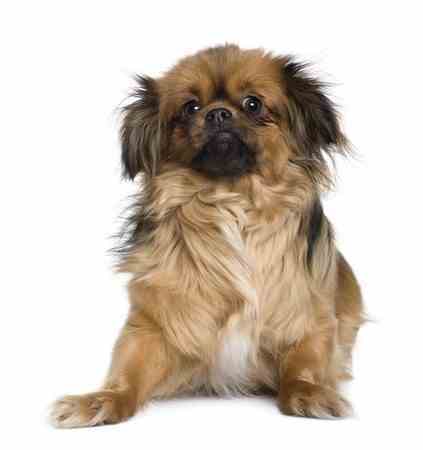 There is a DNA test for the Lhasa that breeders should use prior to using them in their program. Owners can also have their dogs tested to find out if the dog has or doesn't have the disease or is a carrier. This is a skin condition with genetic roots. When this ailment is present, the sebaceous glands in the skin become inflamed and then destroyed. 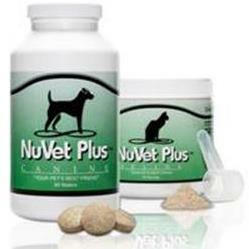 Symptoms include dry scaly skin with hair loss usually at the top of the head, neck and back. If the condition is severe, the dog may have an usually unpleasant odor and the skin seem thick. Secondary infections are common and may cause discomfort in the dog. This group of eye diseases eventually causes the retina of the eye to deteriorate. The dog first develops night blindness and the eventually they lose their sight altogether. Blindness is never a good thing, but dogs can adjust and live fairly normal lives without this sense. Lhasa Apso have appeared in at least two episodes of The Simpsons. We'd love to hear your thoughts about this Breeed. We at Small Dog Place always recommend that you do as much reading about the dog you might like to purchase or adopt before the big day. Here are some books that we have found helpful and hope you will too.